Alert all nationalist Tigrayans including Seb Hidri, General Teklebrhan and all nationalist Woyaneti, and the rest of nationalist Tigray society: For all Tigrayans must know the Amhara card is Tigray will not go after Amhara and they will give up if we make the loudest noises. But Tigrayans know that the Amhara battle will end within 3 to 7 days, Tigray arm forces will walk to Dehre bahri aka Bahridare. Tigray must consolidate all Tigray regions immediately from Angareb River to Lemalimo to Simien Armachiho to Lalibela to Alowuha Milash River and evict all Amhara and Tigray must mingle with Qimant, Woyto, Agew, Argoba and other ethnics within Amhara kilil and fight Amhara until all the ethnics control their territories and we will have lasting peace for our people centuries to come. No Tigrayan think about the unity or stability of Ethiopia, it will be against Tigray interest but on fire will facilitate for Tigray interests immediate and long terms. Let the country go anarchy and help every ethnic to control their destiny and dismantle the country once for all. The Ethiopian prime minister is very impulsive and speaks without thinking and most of his actions are to serve his popularity not the Ethiopian people. The security and political situation in Ethiopia has gone from bad to worst in the past six months. The current Ethiopian government led by Prime Minister Abiy Ahmed couldn’t even control the capital city Addis Ababa. The regime in Addis Ababa has a million things on its plate many of them its own making. The Ethiopian prime minister is very impulsive and speaks without thinking and most of his actions are to serve him and his group not the country or the Ethiopian population. All the Ethiopian regional states are in turmoil mostly because the central government is weak and doesn’t have any control in the security situation of the country. In Somali, Oromia, and Amhara regional states there is active military conflict going on. The federal police supported by local police are battling demonstrators in Somalis state after the illegal removal of the state leadership in. Recently Ethiopia’s blood lines the Djibouti-Ethiopia train track and highways were completely blocked by demonstrators. The same is happening in Afar regional state where the Abiy government tried to pressure the leaders of that state to work with him, but it backfired. Disagreement between the OLF and the federal government escalated to military confrontation and the federal army was sent to deal with rebels in Oromia regional state. Reports indicated many civilians and armed combatants were killed in the conflict. Although Aba Geda elders tried to mediate between the sides the situation is still tense. The only regional state where the Abiy government was enjoying great support was the Amhara regional state, however his support in the state is dwindling because the support was not genuine. Most of the Amhara politicians, those who were part of the EPRDF or those Dergi riff raffs Abiy brought from abroad had an ulterior motive for supporting him. Their support was to attack the TPLF and the Tigrai people and then to control the government. Now some Amhara activists are openly criticizing Abiy Ahmed for not invading Tigrai state because they think TPLF and the people of Tigrai are the biggest obstacles they have because they are furiously protecting the Ethiopian federal system. Abiy Ahmed and those shepherding him are still betting on weakening Tigrai state and strengthening Amhara regional state, therefore they are doing everything possible to prop the falling Gedu administration. On top of that Abiy is trying to appease Amhara extremists by destroying many of the federal institutions. As the world is witnessing the conflict between the regional state of Amhara and the Qemant people is worsening. Ethiopia now is the number one country for having the largest internally displaced people. International organizations estimated there are over three million internally displaced people in Ethiopia. The illegal establishment of the Border and Identity Commission is one of the biggest assault on the Ethiopian constitution to date. The main reason for establishing the commission to redraw the border between the regional state or completely eliminate the state system and this will bring the Abiy government in direct confrontation with the Tigrai state. Should he be crazy enough to go forward and push this colossal mistake on Tigrai, it would be the end of the federation and the country called Ethiopia. That would be the time where the people and government of Tigrai say enough is enough and go on their own. The best thing to do for naïve accidental Ethiopian prime minister is to peacefully resign from his post surrender the country to the military before he does further damage to the Ethiopian people and his family. If he does not remove himself from power, I am afraid his fate wouldn’t be different than Gaddafi of Libya. 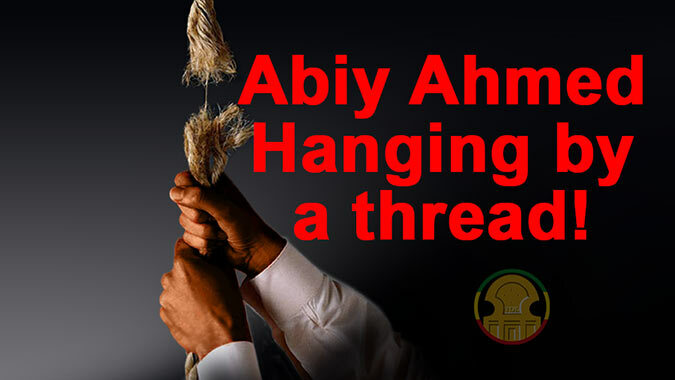 Abiy Ahmed is Hanging by a thread! All of should work to give the final push out of Ethiopia. Last edited by Halafi Mengedi on 10 Feb 2019, 00:16, edited 2 times in total. The nationalists of Tigray are on alert??? How are you Tigray Angareb River, Lemalimo, Simein Armachiho, Lasta Lalibela and Alowuha Milash River, I am coming home my beloved father home!!! Kaam Teneqneqena Deqi Tigraina Gize Zemcha King Yohannes ALula to finish the unfinished business Telal Wedi Tigray EntayKa Tahasb Zeleka??? Where are our beloved selfless and fearless Tigray leaders, bunch of pigs joined woyane to fatten their body and bank account the current leaders??? Halafi, I have never visited Tigraionline. I would say I am allergic to ethnic websites. Wow, if this is a typical article that is posted on the website, which Halafi is proud to post it in ER , the website is worse than I expected it to be. Any cadre who has a couple of beers write a better “ alubaleta” than this. It is a disgrace. Derg regime has come back. History is repeating itself. Amhara are killing other people who do not support their ideas. Many journalists are instructing armed youth to attack people that do not like their ideology. Killing and attacks are everywhere and Government is not doing enough. But why is Tigray slept? why is the dead Debretsion not doing enough to get prepare? I believe Tigray is stronger than any time ever but what I see is weakness from the administration. (1) They don't trust an armed Tigrean youth instead they wish to see provocations from neighboring states/country so that they can stay in their position for ever (2) they are compromised by the central government (such as financial and security issues) and they do not want to allocate money from EFFORT for military training to defend and protect Tigray. I am not defending anything here, Halafi, because I have no any information about the points you raised. Whether it is true or not the points you raised are more debatable than the trash you gleaned from Tigraionline. enzih hulum sew endemitared kebt new yemiasebut kaltesmama telat new.In general they are cowards coward malet lelawn yalewejelu yemigedel malet new. Exactly, TPLFs are cowrds. When the day is getting dark on them they are trying their best to create chaos. Chaos can never be good for anyone. Fortunatly, they have very limited and vanishing power...Truely speaking, even when Oromo is in office (all key position currently is taken by Oromos) they(TPLF) still blame Amhara who is their Qimant politics victim. Sad, Ethiopia has given birth to real haters and saitanics like the member of TPLF. Comminist saitanic TPLF never represent the religious iconic Christian people of Tigray. I stand by my words. TPLFs are cowards and saitanic brutal comminusts and their sole purpose is to destroy and make homeless the novel chritian people of Tigray and Amhara. They start this dirty bussiness as a Shabiya and Arabs Qitiregna, but now it is so much in their blood that they cann't even want to give any chance for the people of Tigray to live free of their brutal North-Korea like life they have created for our brother Tigreans. Tigrean are part of our long history and believe it or not we are one, its only some years isolation that created two sister languages out of the stem Geez. We care for our brother Tigreans, we want Tigreans finally become free of TPLF's stiff control....they deserve better for what they contributed to build Habesha's Ethiopia. TPLF can no more take away, isolate and attack our people, Tigreans!!! Trust me, TPLF is soon gone leaving our people free and flourishing.